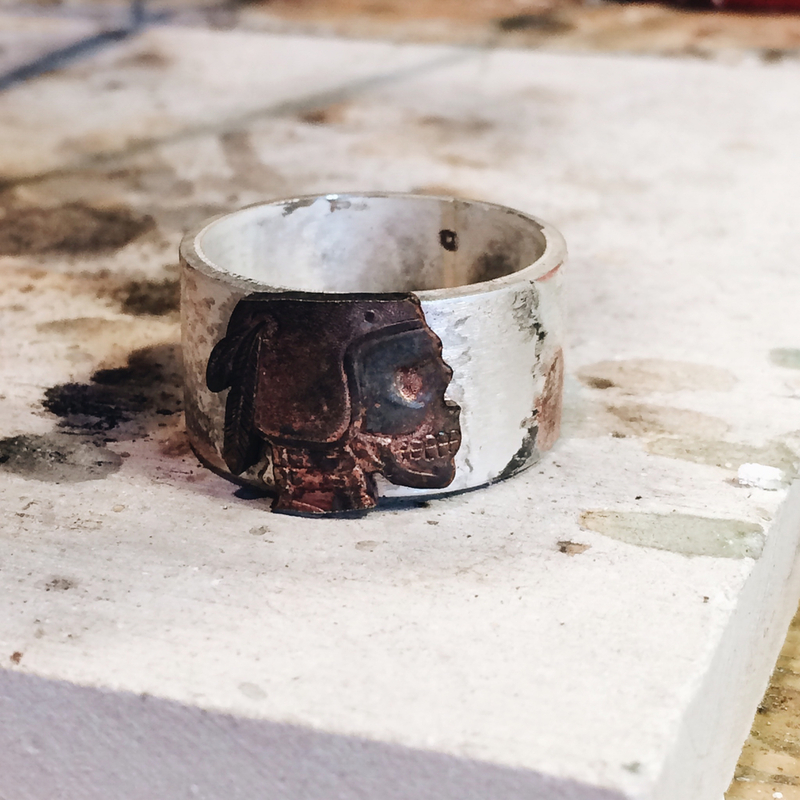 So what is a hobo nickel and how do you make them into rings? Carving coins has a long history going back to the 1700s. When the Indian head nickel came out in 1913 it became a popular due to the size of head as well as the thickness of the coin. If you want more info about the history of hobo nickels, read the wikipedia article. When I was a kid, I was intrigued with Indian head nickels. I've always thought there was something authentically American about them. In 2013 I started playing around with Indian head nickels to see what I could do with them. One day I cut one out, mounted it onto a half inch band and trimmed the top and the bottom. Boom! That worked out well. The next step was to do the same with the buffalo and it was exactly what I was hoping for. I really loved being able to wear the rings because it captured something genuine with them on a ring. So I started making them for friends and selling on etsy.com but wanted to go further. I had a hobo nickel I'd bought a couple years ago and decided the throw caution to the wind and cut it out for a ring. It turned out fantastically. A fella in England, Mr Lee, saw my Instagram picture and told me to check out a nickel carver on eBay name Shane "Hobo" Hunter. When I saw his work I was blown away, so I reached out to him about doing some nickels for me. I told him I was looking for a traditional hobo nickel with a twist, Day of the Dead decorations because I wanted my rings to have an even more unique look to them. Since we've started working together I've started working out new ideas for him to carve. 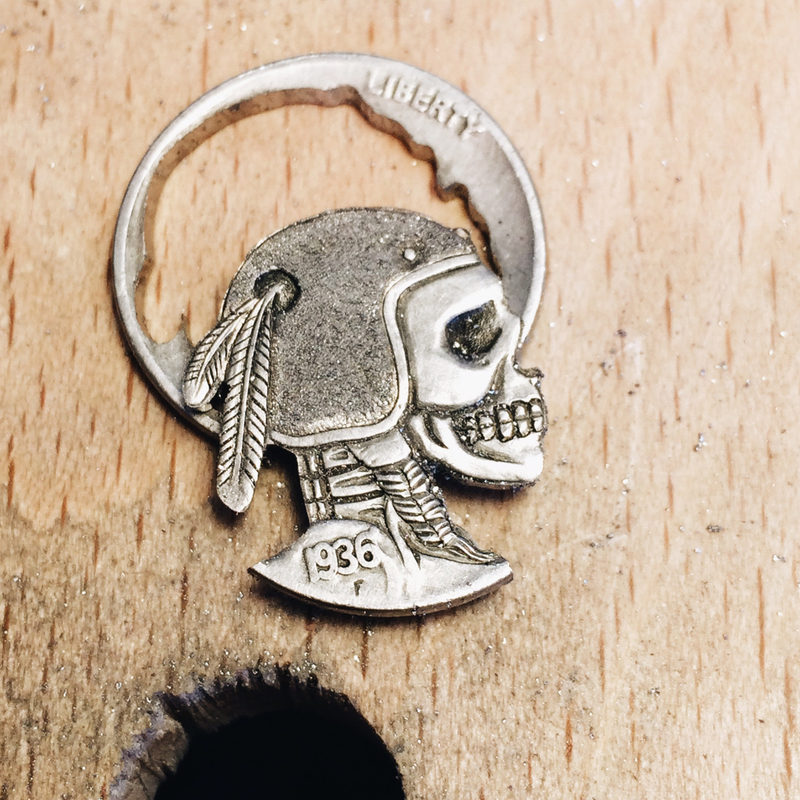 The first new idea was the cafe racer hobo nickel with its helmet and some different things on the side of the helmet. I also had Shane carve a Mercury head dime and was so pleased with the results that I made a new ring for it so I don't have to cut it out of the coin. So, how're these rings made? Here you go, here's how they're made, but why show all this? There's no secret, an experienced jeweler could figure it all out. This wasn't something I read about somewhere, just something I've gotten better at with practice. On top of that, I love watching how things are made so why not show how mine's done. So when you get a ring from me, you're getting something I've learned how to make by trial and error. You're also getting a handmade ring with the work of two craftsmen that comes out of downtown Atlanta. I get my nickels engraved by Shane Hunter in Toledo, OH. I call him and tell him what I'm thinking about and then send him a sketch. In turn he sends me the nickel engraved like this. I then cut it out using a #2 jewelers saw blade which is .5mm x .24mm and cut it out. After a little deft action with the saw, it's cut out. After the ring's been made and sized, the next step is to round the coin so it rests onto the ring. Doing it this way assures that the inside if the ring is round. Not doing it this way puts dents inside the ring if you solder it on flat then round the ring. I hold everything in place with some clamps so nothing moves about. This is what it looks like after it's soldered onto the ring. After it's been soldered on, I get it cleaned up on the outside and inside. Also, I make sure all the solder has been cleaned up and smooth it all out. After it's cleaned up, it's oxidized it in a solution of liver of sulphur. I do my oxidizing really hot because I'm just going for black. After this step, finer clean up is done. 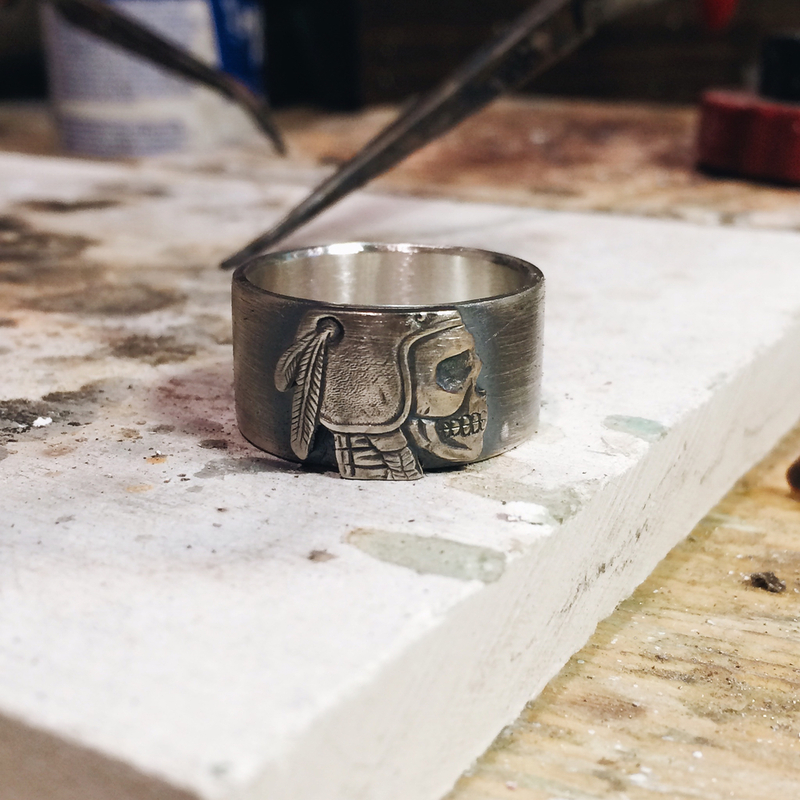 The finished product, a Silver Piston hobo nickel ring and this is the cafe racer version.